After months of preparation, it is my delight to announce that I am to become a publisher and I hope you will join me on the evening of Wednesday 3rd July in celebrating the launch of this auspicious new endeavour. It may seem a curious decision to supplement publishing on the web with publishing between hard covers, but in writing more than a thirteen hundred stories here in the pages of Spitalfields Life, I constantly encounter exciting material that inspires me to create books of all kinds. 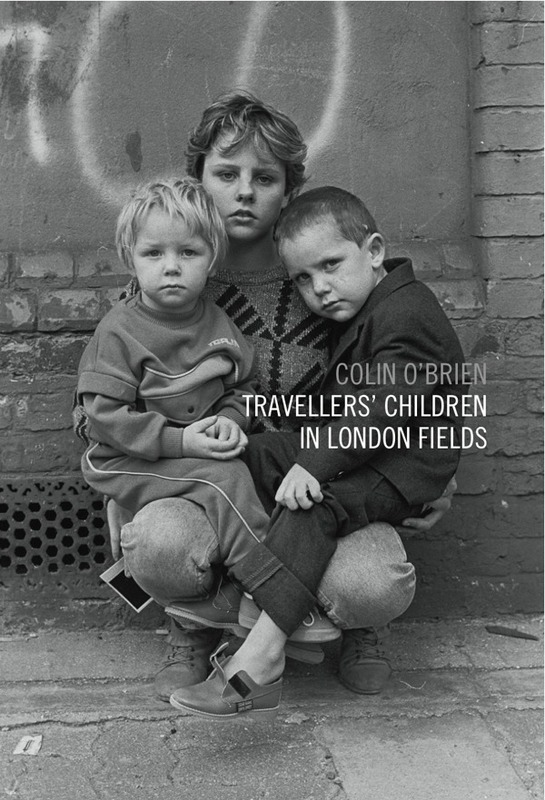 The first title I am publishing under the Spitalfields Life Books imprint will be a photography book of Colin O’Brien’s pictures of Travellers’ Children in London Fields. 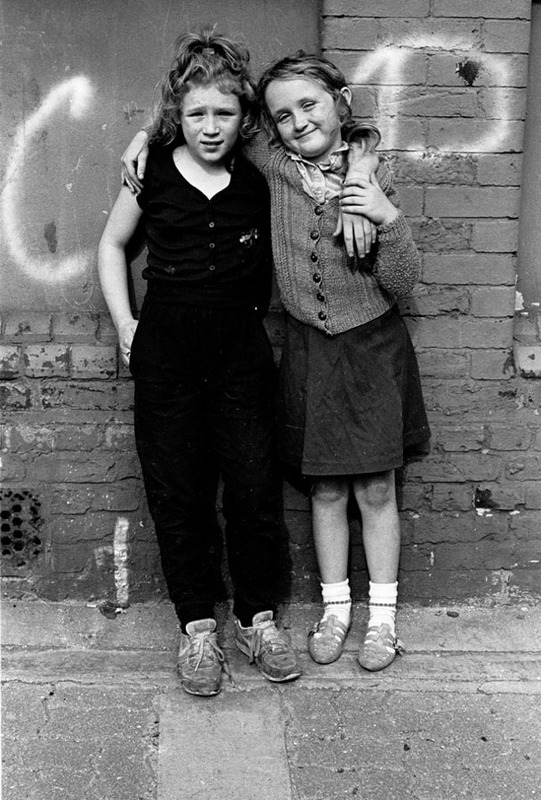 In 1987, Colin O’Brien was photographing buildings in London Fields when he was approached by some Irish travellers’ children who asked him to take their pictures. He gave them Polaroids to take back to their parents and, on the next day, the parents dressed up their children, requesting that Colin take more photographs. 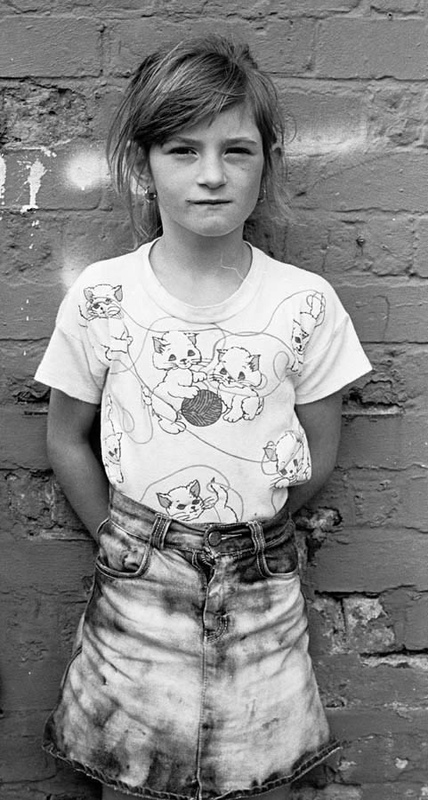 Over the following weeks, Colin took an exceptional series of over one hundred portrait photographs of the children and their parents. The small selection of these spell-binding pictures that I first published here two years ago is one of my favourites and has long been one of the most popular sets of photographs on Spitalfields Life. 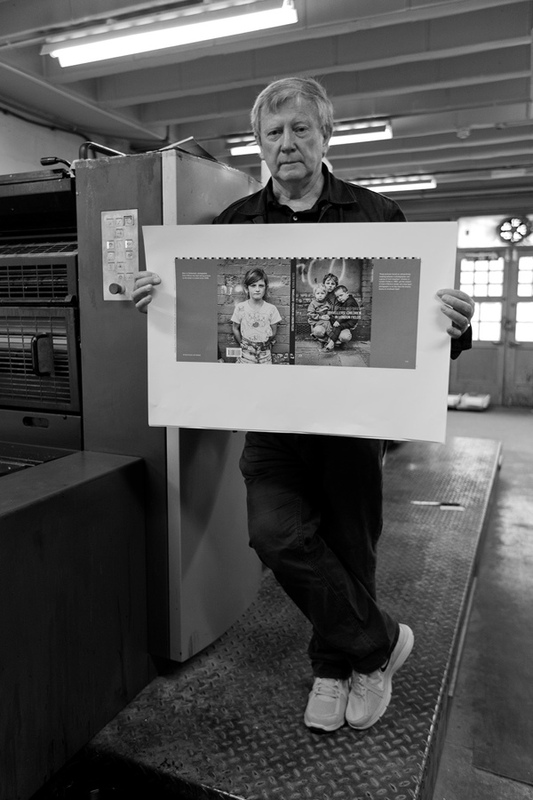 So it was a great pleasure to take the complete set of images to distinguished book designer Friederike Huber, who designed Don McCullin’s books of photography, and give her carte blanche to create a volume of Colin’s pictures. With exemplary skill, Friederike has arranged the pictures in an elegant sequence that permits them be read like a novel, with recurring characters, with multiple story lines and with dramatic set pieces. The result is a handsome hardback book bound in yellow cloth and printed in Spitalfields by The Aldgate Press with a cover price of £10. 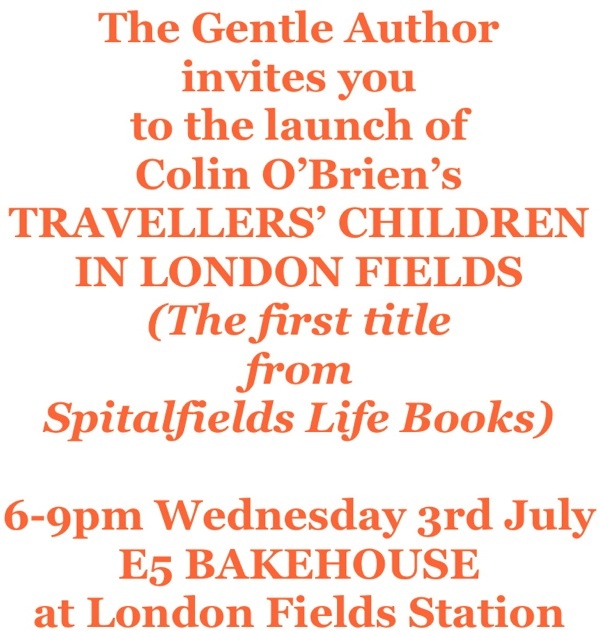 We are working in collaboration with The Broadway Bookshop to stage a launch two weeks today on Wednesday 3rd July from 6-9pm at the E5 Bakehouse beside London Fields Station, just fifty yards from where Colin took the photographs. 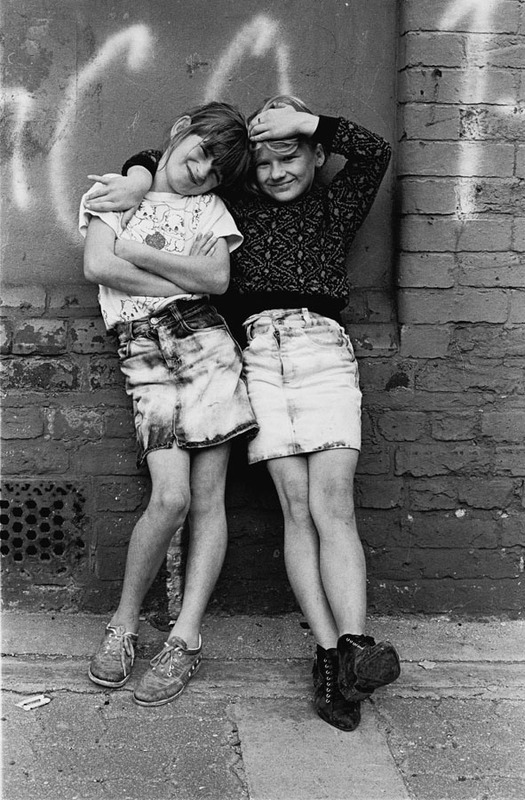 At the E5 Bakehouse, there will be an exhibition of prints from the book, as well as drinks and Irish music, and an opportunity to join Colin O’Brien as he revisits the locations of his photographs and talks about their origins. Copies will available online through this site and in the East End’s independent bookshops from 3rd July. Faber Factory Plus part of Faber & Faber are distributing Travellers’ Children in London Fields nationwide, so if you are a retailer and would like to sell copies in your shop please contact bridgetlj@faber.co.uk who deals with trade orders. Colin O’Brien at The Aldgate Press in Brick Lane with the jacket of his book. bravo! what a wonderful development! lovely pictures too. i am so happy for all the catalyzing this has accomplished, and for how generously you rush in where angels fear to tread. nothing but good can come of all this. so happy to have been on this journey with you. Congratulations! I would love to be there, but sadly, I’m on the other side of the world. oh bum … I have to go to Carshalton that evening – not quite the other side of the world, but sarf o’ river, at least …. What a fantastic idea and what a good choice Colin O’Brien’s Travellers’ Children is for your first step. Really wish I could be at the launch but will be out of the country. Sure you will not be short of company on 3 July. Good luck. The book looks amazing, sorry to miss this launch as we will be abroad, hope it goes well! I wonder where all those children are now, whether they are still on the road? I’d love to be there too. I’m not on the other side of the world, but 1000 miles is far enough. Good luck with this new venture. What a very wonderful, thought provoking book this promises to be. It’s a shame that I won’t be able to come to the event. I’m sure it will be a great launch, and hopefully the first of many! Wishing you a marvellous adventure as you step into the publishing world. Have a great great evening, and Colin behave yourself. Looks like a great book and very reasonably priced. This is such a good idea. Amazing photographs. Congratulations! Here’s to your success. Turns out I am in London that day so will try and be there. Looks stunning! I look forward each day to my brief visit to a part of London I never knew. Though having visited your city some twenty-five times between 1972 and 2001, a chronic illness has kept me from flying since then. Judging from the small, elegant advertisements on the right, you must be familiar with John Lewis’s book, Printed Ephemera. If not, you must try to find an original letterpress copy as subsequent editions were printed offset and lose a certain quality. I was honored to know John and his lovely wife, Griselda, who survives him into her hundredth year. Congratulations on your new publishing venture! This is all very exciting! Best wishes and congratulations. Very good luck in this gorgeous project. I won’t be able to go this time as I will be in Istanbul…but thinking on the book and its success. Congratulations and good luck with the book. Thank you for bringing the East End to life in print. Your song of Spitalfields is turning into an opera. Wonderful! Looking forward to the launch. I’m sure it will be a great success! I have just read about this and would love to attend the launch, especially as during the early 90′s when I was trying to raise money to save and restore the New Lansdowne Club on Mare Street, I brought potential partners through London Fields to meet the traveller families still living there. Over twenty years later I still live in London Fields and still welcome the chance to share our community with these families. Greatly looking forward to seeing and buying the book. Hope it goes well. Looks like a great book.